Next to the power station excavate a huge "hole" with the area of 3 sq km and depth 30m. In theory we can fill the contaminated topsoil of 1,800 sq km × 5cm in the hole. Make the landfill along the coastline near the "hole". Construct there facilities needed to collect and isolate radioactive contamination from pollutants. The agriculture,fisheries,forestry and dairy industries should be continued,as much as possible. 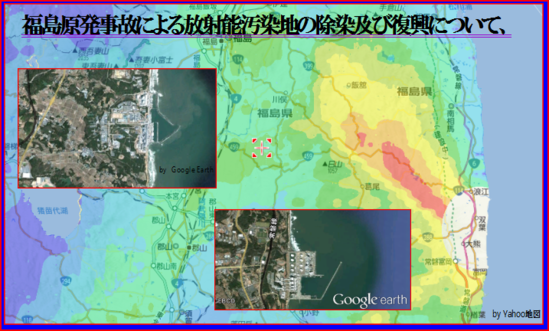 In the fertile land and sea like Fukushima, primary industries will collect radioactive metals efficiently by a biological concentration. Make a radiation shield wall along the breakwater and build the similar wall along the power plant. By connecting the land wall with sea wall;thus, contaminated water and sludges are enclosed shut off from outside. Technologies to be employed to realize above. 1) We may excavate a hole by unattended open-pit mining technology. 2) We will be able to apply vent-technology of nuclear power plant for new incinerators. Radioactive filtered trash and ash after burning will be filled in to the hole. 3) About the high contaminated food,seafood,livestock and crops. Crush them with a high temperature and high pressure steam. Centrifuge them to separate heavy radioactive metals. Reuse clean organics as pig feed,fertilizer or soil improvement. 4) Collect the contaminated seawater and mud in a bay surrounded by walls. Decontaminate the seawater through adsorption equipment. Cured mixture of contaminated materials and mud can be disposed of into the pond. For more information,please see below. Please translate and read them up in numerical order.